Assistant Jail Director Jessica Jackson shows firefighters from the City of Delaware one of the exits used to transport prisoners to the recreation yard. Firefighters asked questions about how the doors open and which routes would be quickest and most efficient during an emergency. 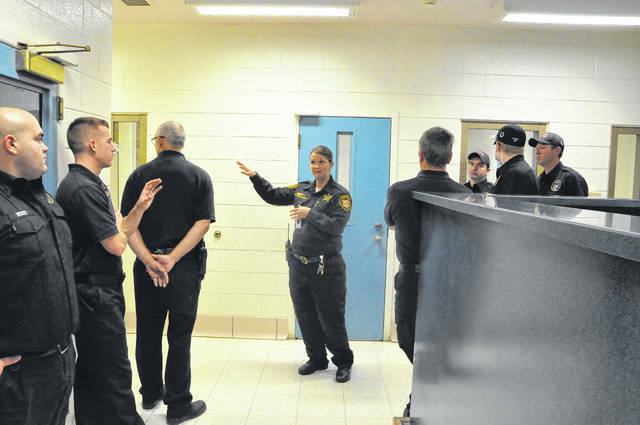 Assistant Jail Director Jessica Jackson gives firefighters a tour of one of the cell blocks Tuesday. One of the issues discussed between Jackson and the firefighters was the sets of two exterior doors that cannot be open at the same time for security purposes and discussed how the doors could be manually overridden in the event of an emergency. Officials from the City of Delaware Fire Department and several other government agencies toured the Delaware County Jail to better prepare for any emergency scenarios that may occur there. 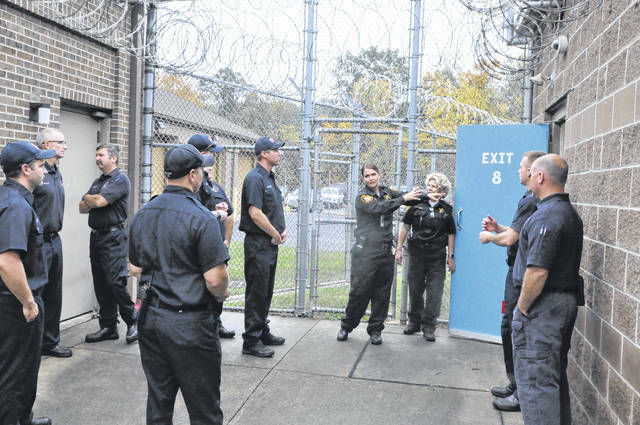 Around two dozen firefighters, representatives from the city police department, county officials and the Delaware County Emergency Management Agency toured the jail Monday with Jail Director Shelley Pfan and Assistant Jail Director Jessica Jackson to gain a working knowledge of the inside of the jail in case of emergency. City of Delaware Fire Chief John Donahue said it was a great opportunity for the fire department to learn where the entrances and exits are and what avenues they can use to travel in and out of the jail. Donahue said the jail is a special challenge because not only would first responders need to get inside, but they’d also need to make sure that none of the prisoners at the jail escape. Donahue said the fire department tries to tour as many businesses and buildings as possible so they know the layout if they need to go into the building in a low visibility situation. Donahue said the fire department and county agencies did a tabletop emergency exercise in August where they simulated an emergency at the jail and identified their weaknesses and adjusted accordingly. Major Jeff Balzer of the Delaware County Sheriff’s Office said the tabletop exercise paid off when the power at the jail went out for several hours in September. He said he was pleased that the jail still functioned smoothly because of the corrections officers’ training. Balzer said the fire department is called to the jail several times a week for medical emergencies but said the tour was a good way for them to see areas they’ve never seen before. Balzer said he really appreciated the other agencies coming out for the tour. Sean Miller, the director of Delaware County EMA, said Tuesday that the tour dovetailed nicely with the tabletop exercise and will make any future response more efficient. Donahue praised the spirit of cooperation between the county and city agencies. This entry was tagged delaware county jail. Bookmark the permalink.